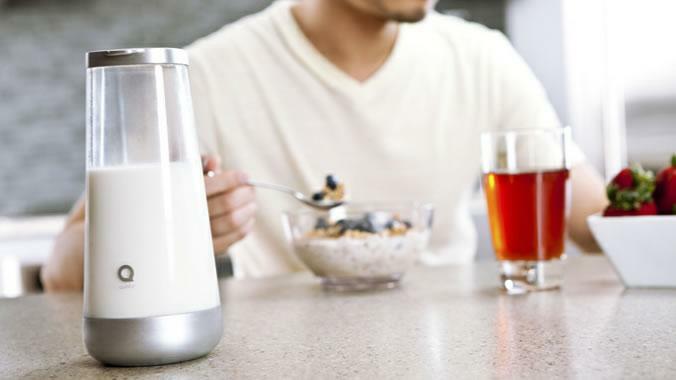 Developed by a product development team at Quirky during a partnership with General Electric, the company has created a new take on the milk jug that feeds the owner data regarding the quality and quantity of remaining milk. Called the Milkmaid, the clear glass jug monitors the pH balance of a liquid such as milk and sends the owner a text message indicating that the milk has spoiled. The base designed for the jug uses red and green indicator lights in order to alert the owner that the milk is good or bad when they open the fridge. The lights also offer a second visual indicator when the amount of milk in the jug drops. In addition to helping the Milkmaid owner avoid drinking rotten milk, text messages are also sent when the jug is completely empty. This could be ideal to automatically alert the head of the household to pick up a quart of milk on the way home from work. Members of the household that use an iPhone can also check the Milkmaid iOS application which lists the temperature of the milk, the amount of milk left in the Milkmaid jug and the number of days left until the milk will spoil. 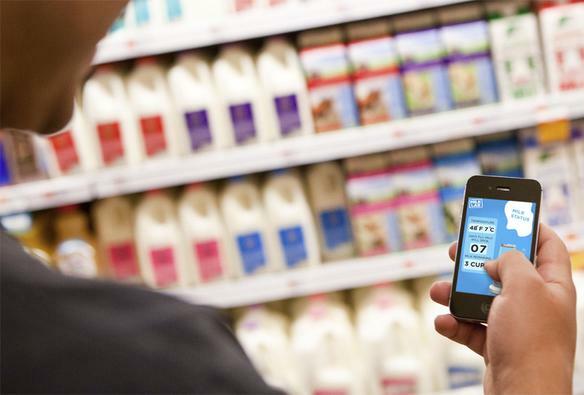 The application also allows users to order milk through online grocery stores and check out recipes for both spoiled and fresh milk. The design of the Milkmaid simulates an older style milk jug, but with modern flair using brushed metal accents. The bottom of the base can be removed for cleaning after repeated uses. In addition to the temperature, weight and pH sensors, the base includes an antenna, SIM card and GSM radio module to feed information to the iOS app. The Milkmaid isn’t available for purchase in the Quirky store yet, but interested parties can provide pricing feedback on the Milkmaid page in order to encourage the company to sell the product. While not all Quirky developed products become a reality, the ones that do transition into manufacturing have a unique quality that makes them useful. For example, the Pivot Power electrical outlet strip allows users to reshape the traditional power strip and wrap the strip around furniture as well as other household objects. 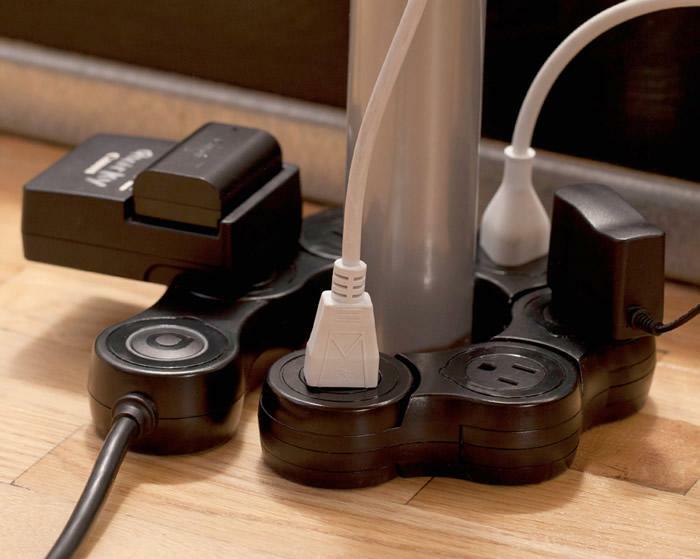 Due to the flexibility between each outlet, Pivot Power owners can plug several bulky AC adapters or battery chargers without covering up other outlets. Another power cable management system called the Plug Hub allows the owner to hide ugly cables in addition to wrapping extra cable within the housing. Other Quirky computer related products to enhance the office workspace include a rubber grip system that keeps cords from calling off the table, a device charging platform to help disguise cables, a mousepad with an erasable writing surface allowing people to leave messages, a double-sided USB drive to help keep work files separate from personal files, a task lamp that can be clipped to the top of a monitor or laptop for extra light and an iPad case with a support brace that allows for a variety of setups.